While understanding the lifestyle of people, we might often overlook the small details of their lifestyle to look for opportunities. Customised services and products are preferred in India at almost all social strata of the society. It’s not just the rich who can ask for customised vehicles or hire a famous fashion designer to create an ensemble. The little pleasures of getting things tailor-made as per one’s requirements makes one feel special and value the experience more. Often Indians see better value for money in certain customised offerings, more than mass-produced ones. 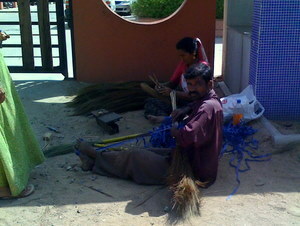 Today morning, I noticed two people sitting outside my apartment gate, weaving together brooms for people. It was the first time I had seen something like this. Normally, brooms would not be a topic that would be listed under the usual household product-customisation needs, but seeing the response they were getting, it seemed like they had found a very unique niche.Â Cost-saving, not enough options in the market, value-for money, the satisfaction of getting a quality product made by supervising the production process, unique household needs could be some of the reasons why some households would prefer using their services. Cost-effective trendiness is another factor that leads the youngsters to the tailors to get custom-made shirts. Latest trends in the market were either very expensive or didn’t fit well as everyone had different physiques. Also, people considered that a tailor would spend more thought and effort on the clothes and thus it would last longer. In the interiors of India, nobody might know about concept of mass-customisation, but they practice it very well nonetheless. 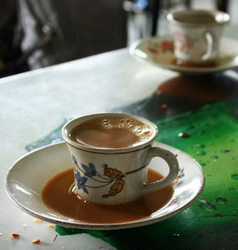 When serving tea in the interiors of Gujarat, they also pour a little extra on the saucer. As the tea is pipinig hot when served and people on the go do not have time to wait, the tea on the saucer cools down quickly and by the time it is devoured, the tea in the cup is ready to be sipped. The little service innovations that are brought about do not always have to be heavy on the pocket. The best things in life, if not free, can be affordable!